The 8th-century Indian Buddhist master, Guru Rinpoche (Padmasambhava), was believed to have flown on the back of a flying tigress from Tibet to a cave on the cliff above Paro Valley where he had meditated for three years, three months, three weeks, three days, and three hours. This very cave where he had meditated became a holy shrine and a monastery was built around it. This monastery is none other than the legendary Tiger's Nest. The Tiger's Nest, formally known as Paro Taktsang, is inarguably Bhutan's most important cultural and architectural icon. "Taktsang" means "tiger's lair" in Tibetan language, but fret not as there is neither a tiger in captivity nor any wondering in the mountains. The formidable temple structure clings precariously on the steep, almost vertical rocky cliff with parapets and roof eaves overhanging 900 metres amidst the clouds above Paro valley, rendering a mythical and celestial aura that makes it seem out of this world. Sitting and living on the edge of the cliff high above the mountains, Paro Taktsang is undeniably a staggering piece of architecture that would take anyone's breathe away. Many have came to Bhutan to see the Tiger's Nest. The arduous three-and-a-half hour ascend over some steep and rugged terrain could be harder than we've imagined, and had certainly made the journey a memorable one. Having said that, it's not an unachievable task for all, young or old. Your friendly tour guide would certainly adjust the pace and expectation according to each traveller's condition or preference. And in our case, it was without a doubt the most laidback possible, as this was the only place we had planned to visit for the day. 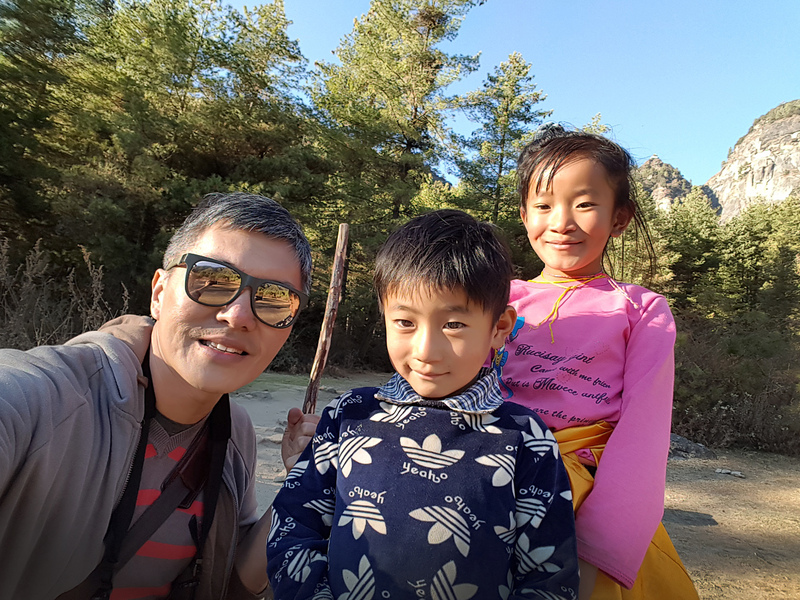 Located just 10 km from Paro town, we arrived at the starting point after a short 30-min ride from our hotel. Not surprisingly, hordes of zealous tourists had arrived and were beginning to commence their once-in-a-lifetime climb. Many were armed with professional trekking gear and supplies. For a moment, we thought we had seriously underestimated the task. Trying to look on the bright side, we grabbed our humble hand-made wooden walking sticks, courtesy of our driver and guide, and looked up the sandy slope ahead with excitement and started our monumental climb. The glorious morning sun had greeted everyone with rays of hope and encouragement at the Taktsang climb starting point. Despite starting from the same point, the four of us decided to take on different means of ascend. 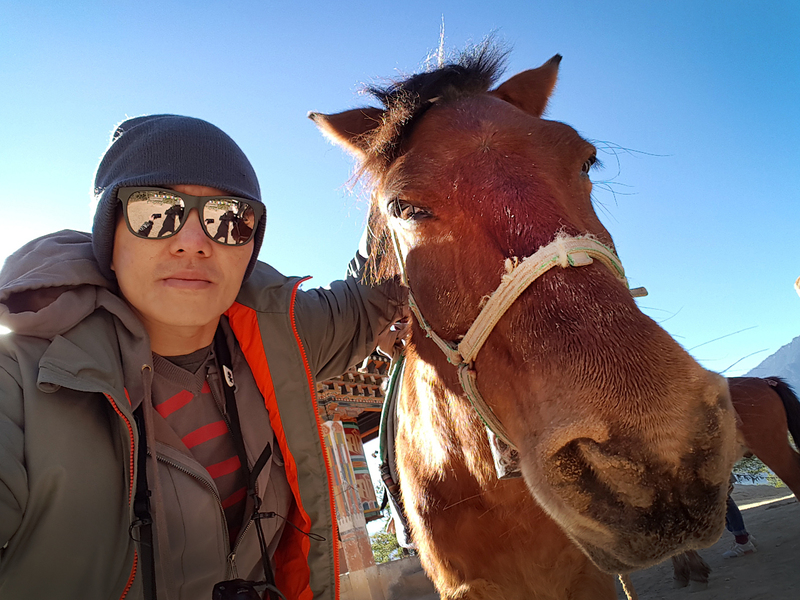 Our two Taiwanese friends were game enough to cover the first leg of their climb on foot; while the two of us decided to conserve our limited energy by going with the horses. To be honest, we just thought that we couldn't make it on foot. Our tour guide, Mr. Jigme, leading our two Taiwanese friends on foot. This is also the area where we would hop on to our horses to commence the journey. Riding up the mountain at a leisurely pace. At some points, the horses were walking right at the edge of the cliff. Better stay still and get yourself balanced on the horseback. Occasionally, we could see the Tiger's Nest up high on the mountain ahead (big cliff on the top right hand corner). Obviously, it's quite a distance and elevation to cover. There were several drinking points for the horses. Very thoughtful of the locals. Our horseman who had guided our two horses up the steep slopes. It was extremely tiring for him as he had to walk at the pace of the horses, which was much faster than regular human walking speed. We could see that he was so exhausted by the end of the trip. Some parts of the path were very steep, and even the horses were struggling to get a good grip with all fours. Finally, we reached the mid-point after 40 minutes on the horseback. This is my dear horse who had worked so hard and brought me up safely. For Nu.700 (approx. USD10) per horse per person, it was all worth it. A big kiss for all the hard work. Thank you! A must-have selfie with my horse. Well-done buddy! This is the mid-point where everyone had to get off their horses and take on the remaining route on foot, like it or not. The Tiger's Nest could be seen not far from here (on the cliff in the middle of the photo). The mid-point is also where we could take a break, enjoy a nice cup of tea and some biscuits, while admiring the Tiger's Nest in a distance. It took us 40 minutes to get to this point on horses and our two Taiwanese friends had taken 90 minutes on foot. That had given us a good break. Enjoying the gorgeous panoramic view of the surroundings while waiting for our friends to arrive (Tiger's Nest on the left faraway and the rest-stop/restaurant in the foreground). Spotted a yellow-billed blue magpie on a branch, enjoying the magnificent view of Paro valley and the Tiger's Nest opposite. After a good rest, we grabbed our walking sticks and commenced our final ascend. The second leg of the journey was quite tough at some areas with steep and uneven slopes, climbing boulders at some points. While some sections could be smoother, their gradients could still be quite steep. An old lady who stopped for my camera, bearing a big smile despite the tiring walk. The five-coloured prayer flags could be seen everywhere along the way. Finally, we could see the incredible Tiger's Nest - the Paro Taktsang up-close in full view after an hour of rough terrain trekking from the mid-point rest station. It was so close yet so far. It had taken us another hour to reach its door step from this point. An up-close admiration of this amazing masterpiece. Hanging precariously at 3,120 metres above sea level. Tucked deep into the rocky mountain, the monastery appears to be carved out of the granite cliff. Sitting 900 metres above the Paro valley (extreme right bottom). A panorama at one of the few viewing points opposite the Tiger's Nest. Another viewing point and rest stop to enjoy this extraordinary panoramic view. Every stop and every glance at Taktsang was still breath-taking and hard to believe. A 60-metre tall waterfall near the entrance of Taktsang. After an arduous 40 minutes on a horse (90 minutes for our friends), plus 2 more hours on foot, we arrived proudly at the entrance of the illustrious Tiger's Nest, or Paro Taktsang. All visitors were required to deposit their bags at the security counter. Sadly and strictly, no mobile phone or camera was allowed in the monastery. The steep staircase leading to the monastery complex. Security was tight and no bags, phones or cameras was allowed beyond this point. We spent around 50 minutes touring inside the monastery leisurely. There was no time limit and one could take his own time when inside the buildings. While it took us 2 hours to reach Taktsang from the mid-point rest station, we took only 1 hour and 20 minutes to descend the same way back to the rest station for lunch. Perhaps, we were also really hungry. Lunch at the mid-point rest station restaurant. It was rather empty as most other tourists were way ahead of us and had taken their lunch. I guess our pace was quite slow indeed. Looking back one last time at this incredible structure and achievement... Salute! While trekking downhill, this adorable boy started running around me and playing with me. His agility and lively pace had certainly made me forget about the difficult journey. Took a wefie with the little boy and his sister. Not the easiest kind of road to walk on. Can't imagine the ascend on foot. And after just 50 minutes, we managed to reach the starting point at the foot of the hill from the mid-point rest station. This was quite an achievement considering it took our two friends 90 minutes to get up the same way. I guess we were all dashing and leaping down the path, greatly motivated by the two lively kids along the way. Despite the long and tiring day, that speechless moment of seeing the Tiger's Nest for the first time was still fresh in my mind. Looking at the sunset across Paro valley from our hotel verandah, I couldn't help but imagine Guru Rinpoche flying over these very mountains from Tibet more than 1,200 years ago. All thanks to him and his flying tiger that had given us this hidden but spectacular temple today.